I’m not that big on historical Kdramas, having only seen Time Slip Dr. Jin and Faith which are both time travel medical shows, but with Halloween being just around the corner I decided to give another one a try in the form of a traditional vampire plot… The Scholar Who Walks the Night. A fictious Joseon dynasty is being terrorized by handsome Gwi, an evil vampire who has been secretly running the kingdom for centuries. Crown Prince Junghyun and Hae-Seo, a vampire who was once Gwi’s mentor but is now trying to stop his evil rein, have found a way to finally get rid of Gwi. The prince tells his best friend, Kim Sung-Yeol, that the plans to destroy Gwi are written in his private journal so in case something happens to him Sung-Yeol can be the one to carry them out. Desperate to get rid of his wicked student, Has-Seo bites Sung-Yeol and turns him into a vampire so he can take over the hunt for Gwi. Once bitten, Sung-Yeol inherits some of Hae-Seo’s powers and his dark garment which will protect the new vampire hunter from the light of day. However, when the two vampires meet face to face, Sung-Yeol is not the victor. Sadly, Prince Junghyun is murdered and Sung-Yeol realizes he must locate the journal in order to end Gwi’s rule and get rid of him forever. Over a century later Sung-Yeol, now known as a great scholar, enlists the help of a young book seller, Yang-Sun, to help him track down Prince Junghyun’s lost journal. The two join forces with Crown Prince Lee Yoon and together they set out on a quest to kill Gwi and forever stop the evil vampire’s rein of terror. Although Kim Sung-Yeol is a vampire, he has fought to keep his humanity and is therefore a kind man who helps those in need. He despises the beastly vampire side of himself and has decided to end his own cursed life once he has killed Gwi. He lives with the haunting memory of his long lost love and how she met her tragic end. Jo Yang-Sun is a bookseller with a secret – she has been masquerading as a man her entire life. Incorporating tales she has heard of an elusive man who walks the night, she has secretly written a novel entitled The Night Scholar and is enamored with the hero of her own imagination. Gwi is an evil vampire who thirsts for power and wants to rule the world of humans. He has frightened many into submission and rules from his underground dungeon. He knows of Kim Sung-Yeol’s hatred for him and is confident he can overpower and destroy the humane vampire if they ever face each other again. 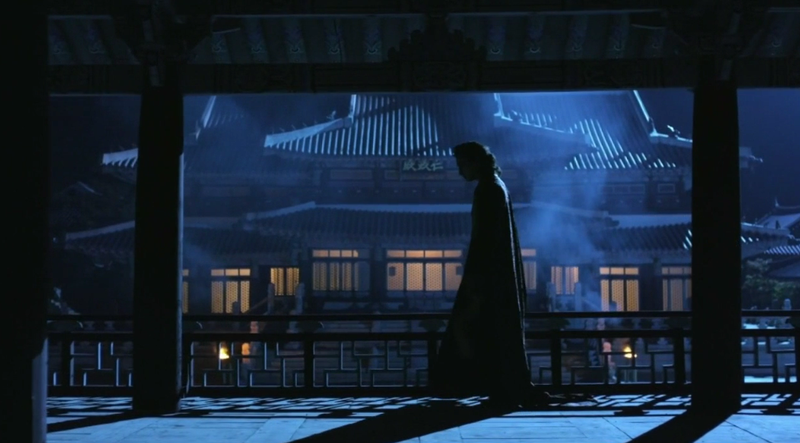 Crown Prince Lee Yoon has seen much sorrow in his young life. Following Gwi’s orders, his grandfather, the king, falsely accused his father of treason and threw him in a pit. Gwi took him out, only to devour him and take him back to his lair to use as a trophy to taunt the king. Lee Yoon also lost his best friend when he was a young child and has been searching for him for many years. In order to get ahead politically, Choi Cheol-Joong gave his daughter, Hey-Ryeong, to Gwi when she was only ten years old. She hates her father because of his greed and wants power over him so she has obediently served the vampire for many years with the secret promise of him making her queen someday. The only person I was familiar with in this show was Kim So-Eun, whose character was Hye-Ryeong. I knew her from watching a few episodes of We Got Married that she was in. All of the other actors and actresses were new to me. I was instantly attracted to Lee Soo-Hyuk, who plays handsome and charismatic Gwi. His acting was perfect! That guy was born to play the role of an evil vampire! The humane vampire character, Sung-Yeol, was emotionally distant which made it difficult for me to warm up to the actor who played him, Lee Joon-Gi. Shim Chang-Min’s royal character, Crown Prince Lee Yoon, was strong yet had to give the appearance of being submissive. I felt Chang-Min acted that complexity fairly well. Jo Yang-Sun was a lovable, personable character that drew me to Lee Yoo-Bi, the actress who portrayed her. She played Yang-Sun well enough for me to like her, right off the bat, and I’m hoping to see her act in more things. This show has some really great special effects where the vampires are concerned. The way it showed how quickly they could move reminded me a little of a cartoon but it was clever, none the less. It was also cool to see them sizzle and burn in direct sunlight. The fighting scenes were wonderfully choreographed and the actors did an excellent job with all the wire work they had to do. None of it looked clumsy at all. Camera angles were well thought out and interesting and there was an even mix of wide angle and close up shots. The director really knew what he was doing. The make-up people did a fine job transforming the actors into vampires. They didn’t go overboard, just made them look icky enough to be unsettling. The costumes were just perfect, beautiful and elaborate for the rich folks and drab and humble for the poorer ones. However, amidst all that great stuff there were some not so great things, too. It would have been nice to have had the vampire “biting” look more real. You could tell the actor was just putting his mouth near the victim’s neck and not actually on it. There was just too much distance between teeth and skin. I think they should have at least made contact for it to look realistic. Actually putting their lips against the person’s neck would have been a good idea. There were a couple things the editing department missed. Although some mistakes were definitely evident the editing that was overlooked wasn’t too distracting. Even though there was a little shaky hand-held camera work which I, personally, very much dislike, it wasn’t enough to be irritating, just noticeable. I also thought the story would have been just as good with only 16 episodes as opposed to its 20. At times it felt “padded”, like things were added to the story simply to lengthen it. Longer isn’t always better. What bothered me the most was the obvious over acting. We have a juicy story with interesting characters and the acting didn’t do the drama justice. Maybe because the show is an intense drama several, but not all, actors and actresses felt the need to over act. That’s never good. That mistake always keeps me from seeing those characters as anything more than imaginary. Darn. I’m still trying to decided whether or not I liked the ending. One minute I think it was perfect and then I’ll think a bit more and wonder if it would have been better to loose the last few seconds. Since I honestly can’t decide, I guess it was written well enough I would have been satisfied with it ending either way. The Scholar Who Walks the Night‘s soundtrack is some of the best music I’ve heard all year from a Kdrama. Beautiful love songs sung by performers with gorgeous voices add great emotion to this romantic vampire tale. Each and every song is perfectly fitted to this story yet can stand on its own merit, separate from the show. I suggest you hurry over to YouTube and listen to the whole thing. You’ll love it. And it’s not just the ballads that are lovely. The emotions of both the peaceful and the intense moments of the show are heightened with the aid of exquisite instrumental music. This soundtrack deserves some kind of Kdrama award. The scenery/cinematography is phenomenal. (Not as good as Summer Scent but definitely in the “gorgeous” category.) I’d think, “Wow, that’s a beautiful forest” and then they’d show the palace and I’d oooooo and ahhhh over it. One thing after another stood out as being an amazing treat for the eyes. A cool waterfall, the countryside in the setting sun, Gwi’s spooky dungeon… everything we see is the best of the best. It’s a really “pretty” Kdrama. If you like traditional vampire stories and/or enjoy Korean historical fiction, this Kdrama is one you should see. You’ll really have a good time watching The Scholar Who Walks the Night. I know I did! The Scholar Who Walks the Night was based on the webcomic/manhwa of the same name.